When it comes to rings, we usually think about gas giants – Jupiter and Saturn have spoiled us that way. But astronauts have showed that asteroids can have rings too – at just 250 kilometres across, Chariklo is the smallest known body which has rings. Previously, only gas giants in our solar system have been seen sporting them: Jupiter, Saturn, Uranus and Neptune. When I was a kid, Saturn’s rings were the most mysterious things to me. For a while, I thought that’s just a cartoon creation, but when I found out they are real, I was puzzled; how could a planet have rings? It just seemed so incredible and impossible to explain. But as I grew up, the mystery revealed itself. 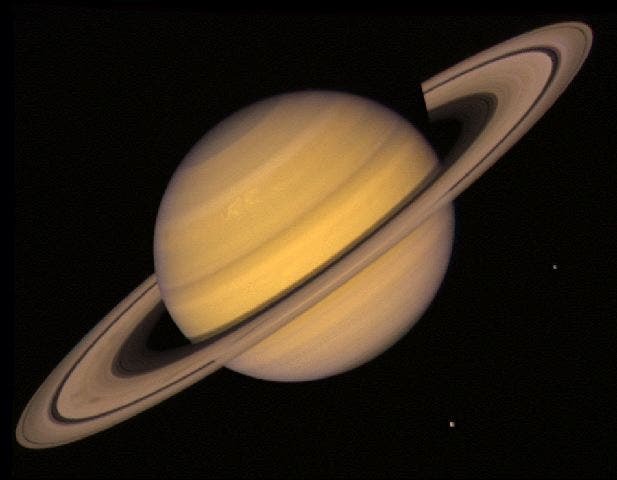 Saturn’s rings, like any other planetary rings, are made up of countless small particles, ranging in size from micrometers to meters, orbiting the planet. Saturn’s Rings. Image via NASA. Ok, that’s nice and all, it’s easy to understand how a gas giant holds the rings through gravity. But what about Chariklo, which is just a small asteroid? The discovery was both an accident and a surprise, says lead author Felipe Braga-Ribas, an astronomer at the National Observatory in Rio de Janeiro. Rings are interesting celestial features, regarded as an initial step in the formation of planets and moons. But with such a tiny gravitational pull, it’s surprising that the rings can actually stay together. “We thought that maybe having rings was linked with the mass of the object. So finding them on a small object was very unexpected,” he says. Chariklo is part of a very elusive class of objects called Centaurs. They orbit around our Solar System in unstable orbits and share similar characteristics to both asteroids and comets. Because they are small, dark and far away, studying them is a challenge, Braga-Ribas says. He and his steam observed the rings while the asteroid passed between the Earth and a star, block the light from it and exposing itself for study. The researchers found a dip in brightness, as expected, when the asteroid traversed the star. But they also detected two much smaller dips, both before Chariklo passed in front of the star, and after. The only rational explanation that astronomers can come up with is that the tiny dips are caused by the rings – this theory is very consistent with the data. Finding rings around Chariklo solves a puzzle about the object, says Braga-Ribas – astronomers observed several times that light reflected from it changed composition. Francesca DeMeo, a planetary scientist at the Harvard-Smithsonian Center for Astrophysics in Cambridge, Massachusetts, says the results are very convincing. “It would be really hard to explain the measurements in any other way,” she says. But how the rings form is still a mystery – one possibility is that another small body could have hit Chariklo, sending debris from both bodies into a disk. It’s just as possible that a disk formed from material that was spun off from Chariklo as it rotated, or the body simply released some ice as it traveled through the solar system. James Bauer, an astronomer at NASA’s Jet Propulsion Laboratory in Pasadena, California believes that further study will reveal the composition of the rings, shedding light on how they were formed. Scientific Reference: Braga-Ribas, F. et al. Nature http://dx.doi.org/10.1038/nature13155 (2014).